The BBC has published an animation showing the development of Stonehenge to coincide with the resumption of excavations at the site. There is also a video log and commentary from BBC Timewatch. See also the popular account of the archaeological project studying the prehistroic landscape of the Preselis in south-west Wales, home of the Stonehenge bluestones. Nowrouz is a very old festival even older than millenniums and governments. Has the Achamenian dynasty had such a festival to begin the New Year? Have they known the first of farvardin and the moment of vernal equinox as well as the entrance of sun to the Aries as the occasion for holding this festival? Answering to this question we should take a look at Achamenian calendar. With regard to existing inscription such as Babylonian calendar as well as the text achieved from treasury and Persepolis fortification we can completely determine the exact date of bissextiles and the beginning of New Year.Nowrouz is always happening at the moment of sun entrance to the aries which is also the exact time of vernal equinox. At least there are some documents available from Sassanid period. This date is the first of Farvardin equal to 21st of March therefore it is expected that in Achamenian calendar the beginning of the first day of the first month of the year should be equal to 21st of March. First from time point of view we should know when the beginning of the New Year in Achamenian period was. As it is perceived from inscriptions of Achamenian period, the time for beginning of the New Year has not been a determined and exact date and the reasons are very complicated. Due to the remaining documents of allover the Achamenian period, the beginning of the New Year in Achamenian period has been fluctuated between 21st of Esfand (12th of March) and 9th of Ordibehesht (29th of April). But generally it was a determined time which was from the 1st of Farvardin (21st of March) to 3rd of Ordibehesht (23rd of April) Due todocuments allover the Achamenian period we can observe that only in the third year of Cambyses throne the beginning of the New Year has happened on 21st of March. The year 527 p.m According to statistics the beginning of the New year has been held on 29th of Farvardin (18th of April) which the day that holds the first rank after that the next ranks are allocated to 9th 11th and 19th of farvardin. The following table demonstrated the number of days of New Year in Achamenian period. According to Babylonians calculations in the Achamenian calendar once upon a several years one month was being added to the 6th or 12th month. The beginning of the first day of the 13th month or the same bissextile month demonstrates that the beginning of this month has been determined on the first day of Farvardin and several days around it. The thirteenth month in bissextile years has begun on first of Farvardin for nine times in Achamenian calendar. Although the existing documents from Achamenian period show a fluctuating boarder of New Year beginning undoubtedly New Year has being begun in the spring (at least the official or formal year) in Achamenian period. This time circulation has been based on the common calculations performed mostly in Babylon by Babylonian priesrs or Iranian magus according to many reports Iranian magus have been in Babylon and as we know observations, Astronomy and calendar have been performed by clergies Although there arre no documents and evidence of holding Nowrouz festival in Persepolis we can not accept that there were no ceremonies performed there with the beginning of spring and natures revival as weel as the beginning of New Year. Now we can investigate several instances to get a clue for this.Apadana hall in Persepolis is one of the largest and most important buildings of Persepoils platform and it is one of the first plans that has been executed in this comlex Observing this hall it is perceived this hall has been built as a court hall or ceremonial castle its planning and construction has been done during Darius and Xerxes throne. The internal wall of northern stairways has a very beautiful relieves classified into several groups the first group is Elamits soldiers following them as the second group are the high ranking and great Persians and Medes walking alternately towards middle stairways. As they have a friendly conversation they are accompanying each other. Some of them holds the other hands and some of them are talking to somebody who has put his hand on his shoulder (of course the conversation from is not picture but it is intimated to the viewer). Most of them hold a lotus in their hand. There were two relieves in the middle stairways in this building taken later to treasury court, has been belonged to Apadansa hall the scene is showing the court in front of a king who is Xerxes not Darius. Later this relief had become as an Achamenian permanent and ceremonial motif in most of them details and forms have been well observed pictured a natural form. These relieves showing thses persons who have flowers in their hand is an evidence of happening of this setting in the spring which is a proper season for flowers growth (the existence of artificial flowers in that period in refused due to different reasons). According to historical reports Iranians have paid a particular attention toward gardens and paradises additionally excavations in Pasargade showed that Achamenian castles had been built in the middle of rivers and gardens. Flowers and plants relieves are observed allover persepolis.Other relieves of northern and eastern stairways of Apadana are allocated to persons called tribute bringer because they are bringing the tributes of their lands for king. Although there relieves are done in theAchamenian sculpture style as it has been mentioned before these relieves are pictured in a very natural from. If the number of the people in every group of countries representative or the number of gifts was more than this the artist could easily picture their number with a proper categorization. Therefore it is acceptable that the number of every group of representative was the same number in relieves. Additionally if the gifts were more than this artist could show the volume and abundance of these goods by using other forms Therefore if the amount of gifts was the same in relieves we wouldn’t accept that these had been presented to king as the tributes of their lands because such an amount of gifts wouldn’t show the annual tribute of acountry.Additionally a ceremonial castle was not a proper proper place for carrying annual tributes of countries and it was never necessary to gather that amount of different goods in that place. Susa seems to be more proper than there from official point of view. So if these things animsla presented to king are not tribute they will be considered as gifts some gifts from representative of every country for king. Calm and happy faces and people smiles of dependant countries show no sign of compulsion fear and dread which is mostly seen in Assyrian relieves why are they presenting gifts to king? Three hypotheses can be propounded here one of them is kings birthday. According to Alkibiades book by Aflatoon Greeks have mentioned the birthday ceremonies among Iranian people. The second hypothesis is the anniversary of throne which shouldn’t be noticed the reason is that although the anniversary of kings throne is the beginning of his kingdom and dates are set since that event it is the date of his fathers death. Fathers hold a very important and particular position among Achamenian dynasty for Achamenian kings have always mentioned and emphasized their father names in their inscriptions. Therefore holding such a celebration for this reason cannot be true. Unless this ceremony has been performed as an introductory ceremony following throne and it should be a long-term period after former kings death.The third hypotheseis is the occasion of a festival for New Year or spring and these gifts have been presented to king for this occasion. Similar ceremonies have been performed in Sassanid period which has been permanent by now and that is giving and getting Eidi and gifts. On the other hand people with gifts in their hands walking towards king are from different countries and put on especial cloths of their countries. The residents of cold northern lands with their warm and completely covered cloth and residents of cold northern lands with their warm and completely covered cloth and residents of warm southern lands such as Egyptians and Ethiopians as well as Indians with their cool cloths have been appeared here. For example Indians are walking toward castle with light jackets and bare foots. This traditional cloth shows on that occasion the weather has been moderate so people with warm and cool cloth have been appeared together easily. This is possible only at the beginning of spring in this region (in autumn due to raining there were several problems for people) with regard to very hot summer in this region and warm cloth the representatives of warm and cold winter in this region undoubtedly representatives of countries such as Ethiopia and India couldn’t bear that weather therefore the only appropriate season for all these people to gather in one place could be spring. The same fact can be perceived from the high-ranking Persians and Medes cloths. Medes are appeared with warm and covered cloths trousers mostly made of leather and cloak with long sleeves but Persians are accompanying them with their spacious and pleated cloths.The third relief in the stairways of Apadana belongs to the relief of lion and cow which is also seen in other castles there are many justifications for this relief by now such as Iranian lion is tearing the Babylonian cow which is not true. Because there are no written documents or any similar relief with inscription, we can not surely discuss it unless we achieve new documents in the future. But some justifications hold astronomical aspects. In one of these justifications cow is introduced as the Taurus and lion as the Leo. Appearance of the Taurus in the morning is the sign of spring. In the middle of winter the leo is settled beside the line of longitude but the Taurus is set in the west and is disappeared. According to this idea, the lion has been presented as appearing and victorious upon dying cow. Of course the Taurus had not been considered in Zodiac. The oldest inscription in cuneiform mentioned the 12 constellations altogether and separately is an inscription in Babylonian cuneiform known as VAT 4924 which is related to 9th of Ordibehesht 419 years before Christ in other words the second Darius throne in Achamenian dynasty. In this text 12 constellations have been mentioned with the same imaginary divisions but instead of the Taurus the Cancer and the Virgo, there are Pleiades Barsavosh and Sammak Azal.Later Greeks substitute the Taurus the Cancer and the Virgo instead of Pleiades Barsavosh and Sammak Azal. So the Taurus had not been considered as Zodiac constellations but anyway it was one of the ten known considered as Zodiac constellations but anyway it was one of the ten known constellation of those who would have observed the stars. As we know many constellations in Babylon had appeared after the occupancy of Babylon by kassites kassites have been considered among Aryans who inmigrated before Persians and Medes and they were living in Zagros mountains Perhaps these ideas and constellations have gone to Babylon by them. Babylonian priests may complete these ideas.Then during many years these constellations achieved twelve divisions whereas before they had been based on the Babylonian beru unit equal to 1/12. The unmber of petals of lotus is a sign of the same fact in other words the existence of 12 petals is the sign of 12 months But there are several lotuses with 13, 14 or 8 petals The Aries had been known by everybody it was the introduction of the beginning of New Year. Spring begun with sunrise in the Aries. New sun does not rise in the Aries because due to earth movements since two thousands years ago sunrise has entered to the pisces so sun rises in the pisces putting fish in the Haft seen has become common. Particularly two fish should be in the pitcher it means that it is the symbol of the fish in the pisces Did lamb have any role in the New Year ceremonies when sun did rise in the Aries there are relieves of some people in the stairways of persepolis itself that are carrying dishes food and lamb with themselves. According to their cloths undoubtedly these people had been Persian and mede clergies.These people are taking things with themselves for ceremonial customs this idea that they are taking food for king is false taking too many live lambs which are not prepared as food into ceremonial hall of the castle does not have a logical concept Unfortunately we can not say what kinds of ceremonies have been held in these castles such as lan ceremony mentioned many times in Persepolis inscriptions These ceremonial customs didn’t have any occasional order from time point of view. It can only be imagined that perhaps the same method would have been followed if such customs and gift giving gad performed in these ceremonial customs or for holding the New Year festival and beginning of spring. In ceremonial custom of Lan to worship gods, different things have being brought and according to inscriptions distributed among people such as sheep wheat, floor, wine, beer, barely, fig and date these foods were being presented to gods.Among the mentioned items wheat floor, wine, barely and date have somehow been presented in Haft Seen as it follows wheat and barely as Sabze floor as bread wine as vinegar of course a glass of wine has been put in Haft Seen in the past. Date has been being put in some of the Haft Seens it has been said that Sassanid kings drank of a glass of milk that dates had been put in it in the Nowrouz morning. Perhaps after changing the position of sunrise from the Aries to the pisces Iamb has been replaced by fish additionally it can be said that serving fish as Nowrouz foods can be of the same reason. Undoubtedly bringing grains and cereals is one of the same customs which is very old too its background may refer to the beginning of using technology in agricultural period and it is always one of the oldest narrations. In old Testament in genesis at the fourth episode it is written that Cain was shephers and Abel was farmer.So we may refer the background of this festival to the human age and food production Haft Seen should be presented with the same grains in the beginning and during many years other things has been added to it. According to writers and historiographers of Islamic period these ceremonies have been customary during sassanid and even lslamic period.In al Mahasen va Al Azdad book has been written an auspicious and well known man entered the court in the Nowrouz morning who put a silver table in front of king. Some cookies have been put beside the table made of different grains such as wheat barely millet pea lentil rice sesame and cooked bean. He took seven kinds of these grains and put it beside the table. Seven stems of willow olive quince and pomegranate trees had been put in the middle of the table to foresee the future they considered their from a good token As it is perceived from the mentioned points we can under tand how the number seven is important. The oldest text that Haft Seen with number seven has been mentioned in it is the book of Abu Reyhan Birouni, he has written when Jamshid defeated Satan who had limited the blessing goodness raining and verdure again these blessings were appeared. Every dried farm stem or tree were revived and renewed therefore people called that day as New Day in other words new day and new circulation so everybody planted a barely in a dish a memorial and hollyness then this custom remained among Iranian people. Since then people planted seven grains in seven dishes in Nowrouz and let them grow green.They foresaw the good and bad products and the situation of farming and living by observing this growth. So plants were formed the major elements of Haft Seen. Perhaps it canbe said that Haft Seen word has been derived from Haft Sini (seven trays): or maybe in the Islamic period Haft Sabze (seven green grains) have been called as Haft Seen because this custom is counted as the customs before Islam. In that period the alphabets after Islam Some of the things in haft Seen do not begin with the alphabet seen such as mirror fish pomegranate brazier candy water sour orange egg milk and etc. which are one of the major elements of Haft Seen there is no need to mention that each of the items in Haft seen has a deep concept and meaning whose background should be sought in the darkness of history. But everything on Haft seen generally intimate the same thing and that is the beginning of growth and blessing in the world and nature.Doesn’t Persepolis itself express this concept? Allover Persepolis relieves of growing and blooming flowers and plants can be seen on the walls between the relives margins and even on the doors of tombs covered by lotuses. The distance between the representative groups on the northern and eastern stairways of Apadana has been covered by relieves of pine trees.A row of plants is seen on the margins of stairs whose difference in height show plants growth upwards and this is intimating the movement. These flowers are even dug on the capitals and on the cows neck on the capitals in fact there are scenes of plants growth and blooming as well as natures revival allover persepolis In other words the repetition of world creation is done by Ahura Mazda This is also emphasized by Darius Xerxes and other governors of Achamenian dynasty in the beginning of the inscriptions particularly in Persepolis Ahura Mazda is the great God who created the world sky and people as well as happiness for people everything in this complex express the creation of spring blooming and revival. How can we reduce the impact of looting? I received news yesterday (Tuesday) afternoon from Henry Fischel's caretaker that he had died. He had been in the hospital the previous week, but had returned home on Friday. He was 94. Born in Bonn, Germany in 1913, Henry A. Fischel was the son Anna (nee Suessengut) and Adolf Fischel. After completing secondary school in Bonn, he studied philosophy at the University of Berlin, and Judaica at the Hochschule fur die Wissenschaft des Judentums, a liberal rabbinical seminary in Berlin. He was ordained as rabbi in 1939, after having been detained for several months at a Nazi concentration camp. He continued his studies at the University of Edinburgh, in Scotland, and was awarded a PhD in 1945. In 1941, he came to Canada, where he initially lived in a holding camp, and served as rabbi for other refugees from Germany. For the next half century, he held distinguished rabbinical and academic positions in Canada and in the United States, including professorships at Brandeis University and at Indiana University. He joined the faculty of Indiana University in 1961. He published numerous books and articles exploring the relationship between Jewish literature and the Hellenistic world, and was a pioneer in this area of research. Among extensive academic honors and offices, he served as president of the Society of Biblical Literature in Canada, and was awarded a Guggenheim Fellowship. He was a cherished husband and father, and a beloved teacher, colleague, and friend. An accomplished musician, he delighted his many friends and neighbors at Meadowood Retirement Community with piano recital-talks. Among his other hobbies, he was an avid chess player, a near-expert philatelist, and an eager tennis player. As a student, he played soccer, and twice competed in international boxing bouts, as a youth fly-weight. He is survived by daughter, Antoinette Jourard of St. Augustine, Florida; daughter Miriam Herman and son-in-law Marvin Sharp of Victoria, BC Canada; nephew Robert Newhouser of New York, New York; five grandchildren, and five great grandchildren. He was preceded in death by his parents, his wife Sylvia (nee Morris) Fischel, and his sister Lotte Newhouser. His mother, nine uncles and aunts, and three cousins perished in the Holocaust. Memorial contributions may be made to the United Way. Funeral services will be held at Beth Shalom at 1 PM Friday, March 21, with Rabbi Mira Wasserman officiating. Following interment services at the Beth Shalom Garden at Valhalla, friends and family will gather to share remembrances at Meadowood, in the lower level. You can also check the What's New in Abzu blog, which lists nearly everything entered into the database, more or less in the order in which thye are entered. At the moment ETANA Core Texts includes 355 volumes, browsable by author or title. At the moment 557 addresses are subscribed to the ETANA-Abzu-news mailing list. Many of you will have heard already of Ross's death on Saturday, March 15, 2008, at his home in Lexington, Kentucky. "Those who knew him will remember him for his generosity and willingness to offer advice, and for his ability to see connections and build bridges between projects and people". Is anyone blogging the AOS meeting? 218th Annual Meeting: Call for Papers and Information (Deadline for submission of paper proposals and abstracts is 15 October. 2008 dues and meeting registration fee must accompany submissions. PD(Q) is an experiment in translation. When it was first introduced on the Ancient World Bloggers Group blog, I eagerly agreed to participate. Since that time I have sought to understand what it is that we are trying to do and to recognize the implications of translating onto paper texts developed in the digital genre and medium of blogging. The mechanics behind the idea seemed quite straightforward, as the following blog posts will reveal. Bloggers would submit their best posts to a group of editors who will edit these posts, offer some form of mild peer review, and then assemble them in a quarterly journal which will be available at Lulu.com as either an electronic publication in PDF or in paper form for a modest price. At the same time, the posts included in each issues would be entered into a digital archive in a format suitable for stable, long-term storage. The benefit of a paper version of the blog posts is to attempt to cross the divide between the kind of people who are comfortable with online, digital media, and people who feel most at home in the world of paper publishing. This happens to be a very current topic, as the discussions surrounding the Indiana University libraries announcement of the electronic Museum Anthropology Review over the past several weeks have shown. Some of these debates, however, reveal the persistence of considerable hesitancy to regard online publications as equal to those distributed on paper. In some regard, the decisions of PD(Q) to provide a print venue for web based content reflects a kind of reverse migration from an fluidity and instability of an electronic medium to the staid legitimacy of a the printed page. A movement from an electronic medium to paper may well be simple for those electronic journals which continue to employ the basic format of print publications. The method that we will use to move the blogs from the web to paper reflect just such a simplistic approach. The webblog posts are moved from the web into a word-processor, edited for basic style (i.e. spelling and basic grammar), and then formatted for the dimensions of standard paper. This process, however, brings to the fore a number of potentially valuable questions regarding how blogs or text native to a digital format are understood as a form of writing (I use the term “form of writing” to encompass the medium, genre, and style of a text). The following blog posts reveal some of the issues surrounding the idea and process of translation from one form to another; other issues, however, were explored other post, in emails, and comments on these posts which for various reasons we will not include in the print version of PD(Q). I will take the liberty of bringing up some of these issues here in a general, if somewhat superficial, consideration of the process of translation from the blogosphere to the world of paper publishing. The first step in the translation process is extracting the blog text from the context provided by the blog itself. Blogs provide a vital context for this form of writing. From their onset, blogs were closely tied to the ephemeral communities and networks that appear on the internet. These communities are visible through the practice of linking to other blogs both through hyperlinks in individual posts and through lists of other blogs, called blogrolls, typically appearing on the side of the webpage. Both hyperlinks to other blogs and blogrolls served to contextualize conversations taking place in the blogosphere by validating the work of colleagues in the community. In many cases bloggers forge relationships through repeated references to the work of other bloggers often over the course of multiple posts spanning week or months. Translating a single post – or even a whole series of posts – from the blogosphere to paper removes some of the markers indicating that a blogger is a member of a particular community (although the PD(Q) community certainly replaces some of that) and strips away some of the meaning from a post that goes beyond what is contained in text and argument. While most of better bloggers might admit that each post can stand like a miniature manifesto, most would also concede that what makes the blogosphere interesting and perhaps even valuable is that links and blogrolls make visible the exoskeleton of context and community. These links between bloggers and posts are most often made manifest through the use of hyperlinks which allow a reader to move laterally across texts and pages. We resolved to render hyperlinks as footnotes in our translantion of these texts from digital format to paper. This shifts the reading of a blog post from an exercise in intertextuality to the more traditional practice of continuous reading which marginalized a key indicator of the texts original context. On the web, hyperlinks in the text beg the reader to move laterally “across the text” linking from page to page and promote ways of reading that destabilize the integrity of the text. In the place of sustained argument essentially native to the linear arrangement of printed texts, hypertext encourages experiments with allusion, intertextuality, and at times even bricolage. The different techniques used by bloggers to construct their texts (and anticipated by readers of these texts) highlight the difference in form, content, and reception from the formal printed page of academic publication. In particular, blog posts embrace the more improvisational, allusive, and ephemeral character of the medium bringing to the fore their provisional nature. Unlike the more linear and consequently more definitive statements that appear more commonly in paper journals, the provisional nature and form of blogs allows them a greater range of experimentation and speculation. Their interactive character intersects with their less formal tone and style of expression to evoke conversations or perhaps, in academic circles, the less formally structured experience of professional conferences. As such blogs represent “works in progress” their formal publication in a venue such as PD(Q) with an eye toward increased circulation reflects an critical interest in the process of scholarship which stands apart from the more definitive works common to more formal print journals. The interest in the provisional and in the scholarly process parallels a movement across the humanities fueled by important developments in critical theory. From at least the 1970s, scholars from across disciplines have sought to demonstrate the myriad variables active during the interpretative process. In archaeology, for example, the growing interest in reflexivity has sought to capture the archaeological experience and the interpretive process at the “trowels edge”. The broader implications of this work is a growing appreciation of the contingent and provisional nature of all knowledge. The publication of the blog posts here, despite the recontextualizing exercise of translation from digital media to print, serves an important function to document the interpretative and creative processes that undergird intellectual life. The following excerpts from a rather lengthy and more involved discussion provide modest insights into the processes of creating a print journal from the digital material in the blogosphere. The arguments advanced in these posts contribute to the ongoing discussions into the nature of digital publishes (and blogs in particular), and the role of print media in the future of academic life. The Monastery is a place in Second Life, in a sim named Alpine Meadow and owned by a virtual communauty, the Confederation of Democratic Simulator (CDS).The Monastery was built on a land bought with donations of citizen of the CDS. It is managed by a virtual non-governmental organization, Virtus. The Monastery is dedicated to activities about spirituality, wisdom and knowledge and is a symbol of the transmission of knowledge from the Antiquity (CDS sim Colonia Nova) to the Middle Age (CDS sim Neufreistadt). For this reason, the Monastery is developping a virtual library showing this process of transmission, with a scriptorium (work in progress). The Chapel hosts exhibitions about art and culture. The new exhibition presents the theme of the pleasures of the table in Ancient Roma, from the production of food to the banquet, including the cooking. The exhibition will stay open from the 9th March to the 26th April then it will move to sim ROMA SPQR. Guided tours (see in SL events) and a snapshot contest will be organized. All the objects presented in the exhibition are designed by Popea Heron, a designer from ROMA SPQR community. Some of these objects are animated. 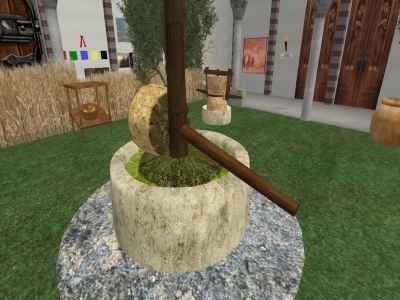 SL residents can experiment the life of people in roman time just by clicking on these pieces: slaves working with olive oil mill, cook, patricians eating and drinking in the triclinium. Some roman clothes are available.